This beautiful Pearl was hand fordged with the Pearl suppended with a Copper Rivit. This Pearl came from a strand of very nice white cultured all measuring 6.5mm. The Pearl is very white high lustre with a slight hint of creme. The pearl is the oldest known gem, and for many centuries it was considered the most valuable. Unlike all gems, the pearl is organic matter derived from a living creature - oysters and mollusks. 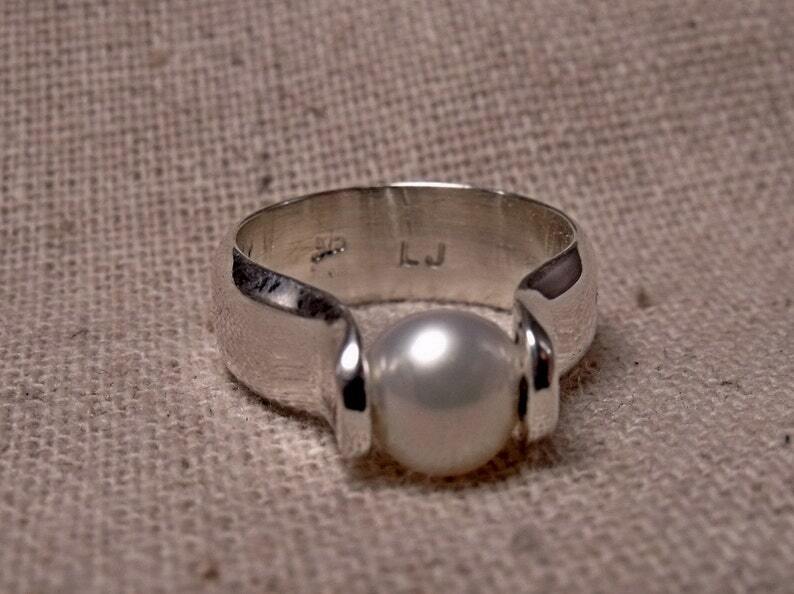 The pearl is an astral stone for the signs Gemini and Cancer, and astrologers link it to the moon. It was said in some early cultures that the pearl was born when a single drop of rain fell from the heavens and became the heart of the oyster. Pearls have been called the 'teardrops of the moon'. Some believe that pearls were formed by the passage of angels through the clouds of heaven. I will make you one very similar to this in your size. I can put other colors of Pearl or Different gems or beads in this ring.